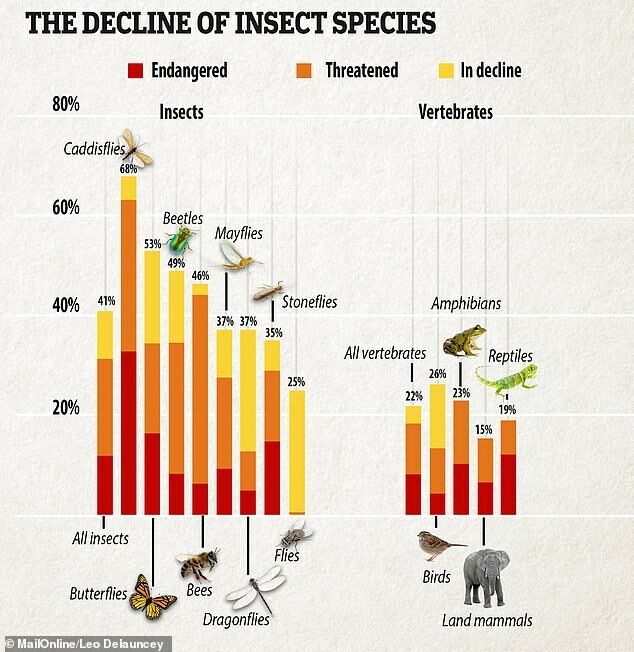 A damning study found 41 per cent of all insect species are in decline and the loss of these animals will trigger a 'catastrophic collapse' in the planet's ecosystems. Insects have long been heralded as the 'great survivors' of the animal kingdom and it would require an astonishing degree of destruction to eradicate them permanently. Researchers have defended the hyperbolic claims and insist they are not alarmist - saying they are hoping to raise awareness of the ongoing issue facing insect conservation. The findings build on previous claims that Earth has entered its sixth mass extinction - the first since a giant asteroid slammed into modern-day Mexico and triggered the demise of the dinosaurs 66 million years ago. Intensive agriculture was found to be 'the root cause of the problem', but a host of issues were identified by the researchers as contributing to the insect genocide, such as climate change, urbanisation, habitat loss, disease and the introduction of invasive species. He said: 'It is probably very unlikely that you would lose every single insect, but highly likely that if we do not change agricultural practices we will lose the vast majority of species and individuals. 'An important point to make is that long before the last one died it would be ecologically extinct and unable to perform their function. 'They would offer no pollination or pest control services and be an insufficient food source for many animals. Insects are 'essential' to all ecosystems because of their role in pollinating plants and flowers, and as a food item for other creatures, the researchers say. It read: 'The [insect] trends confirm that the sixth major extinction event is profoundly impacting [on] life forms on our planet. 'Unless we change our ways of producing food, insects as a whole will go down the path of extinction in a few decades. Instead, he hopes the review's dire outlook will 'really wake people up'. He described the 2.5 per cent rate of annual loss over the last 25-30 years as 'shocking'. Insects are an essential part of the world's ecosystem and are more plentiful and varied than any other group of animals. 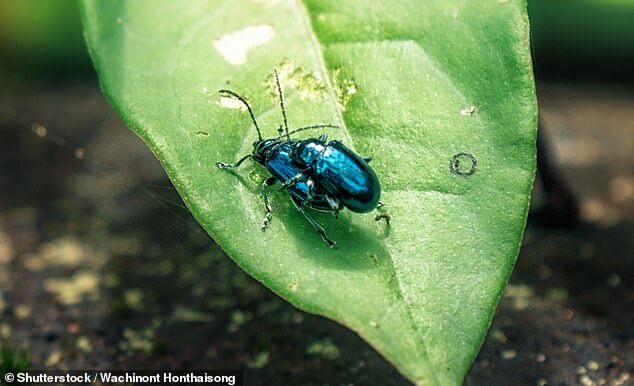 'If insect species losses cannot be halted, this will have catastrophic consequences for both the planet's ecosystems and for the survival of mankind,' Dr Sánchez-Bayo told The Guardian. He added that the 2.5 per cent loss of insects annually is 'very rapid' and 'shocking'. Mark Wright, Director of Science, at WWF said: 'This is not about a summer without the chirp of crickets - this is about the disappearance of the foundation of life on Earth. WHAT IS EARTH'S SIXTH MASS EXTINCTION? A 2017 research paper claimed a 'biological annihilation' of wildlife in recent decades has triggered the sixth mass extinction and says the planet is heading towards a 'global crisis'. Scientists warn humanity's voracious consumption and wanton destruction is to blame for the event, which is the first major extinction since the dinosaurs. More than 25,000 species of 91,523 assessed for the 2017 'Red List' update were classified as 'threatened'. The dawn of the mass extinction coincides with the onset of the Anthropocene - the geological age defined by human activity being the dominant influence on climate and the environment. Dr Bladon told MailOnline that the methodology provided an extensive assessment of the world's ecosystems. He said: 'There are inevitable gaps in the data collection, with there being far more information for Europe and the US than some regions of Africa, for example. 'Despite this, I doubt any scientists reading this scientific study would collect any data that would rebuff the findings and come to a different conclusion. 'It is important to collect more data but I don't think any scientists reading this report would expect it to change and the expectation would be that the trend is the same regardless of any further data collection. 'Whilst yes we knew more certainty would strengthen the message, the conclusion would remain the same. 'The issue now lies at the door of the general public and politicians to do something. 'Scientists have identified the concerns and conservationists have found a solution which would fix the issue but they fail to be implemented. 'Scientific understanding absolutely underpins government policy. WHEN WERE EARTH'S FIVE GREAT EXTINCTION EVENTS? Five times, a vast majority of the world's life has been snuffed out in what have been called mass extinctions. The largest extinction event and the one that affected the Earth's ecology most profoundly took place 252 million years ago. As much as 97% of species that leave a fossil record disappeared forever. The report from the UK's department for environment, food and rural affairs (DEFRA) called this an 'ecological Armageddon'. 'That the worst five years ever for butterflies have all been in the last decade should ring major alarm bells,' he explained. Neonicotinoid eradication was heralded as a 'major victory' by campaigners but remains a small positive step in the face of overwhelming decline. Matt Shardlow, chief executive of wildlife charity Buglife, said: 'It is gravely sobering to see this collation of evidence that demonstrates the pitiful state of the world's insect populations. 'It's not just about bees, or even about pollination and feeding ourselves, the declines also include dung beetles that recycle waste and insects like dragonflies that start life in rivers and ponds. 'There is not a single cause, but the evidence is clear, to halt this crisis we must urgently reverse habitat fragmentation, prevent and mitigate climate change, clean up polluted waters and replace pesticide dependency with more sustainable, ecologically-sensitive farming,' he urged.